As a kid, I remember my parents setting up a small village each Christmas. My mom would use poly-fil fiber (aka pillow stuffing) for snow. I was always fascinated by the village, as I saw it as a playground for Hotwheels cars and such. 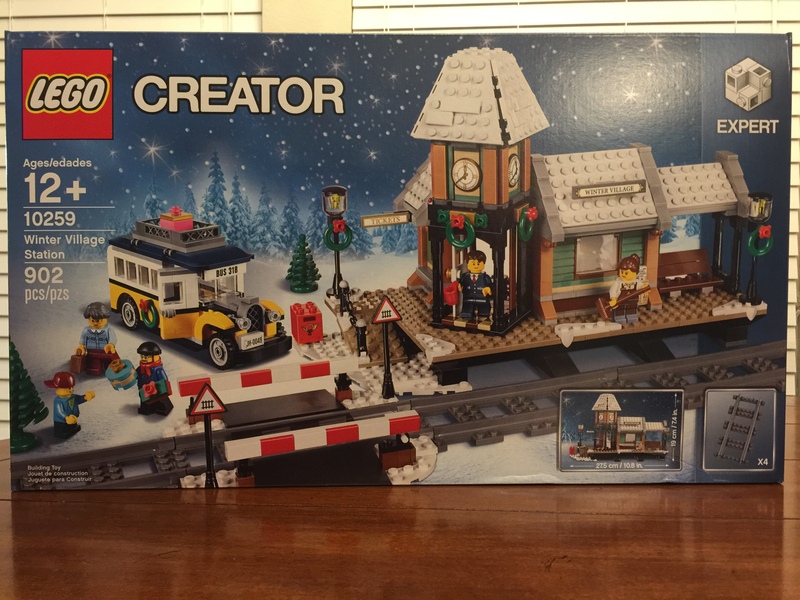 I purchased my first Winter Village set back in 2014, picking up Santa’s Workshop. 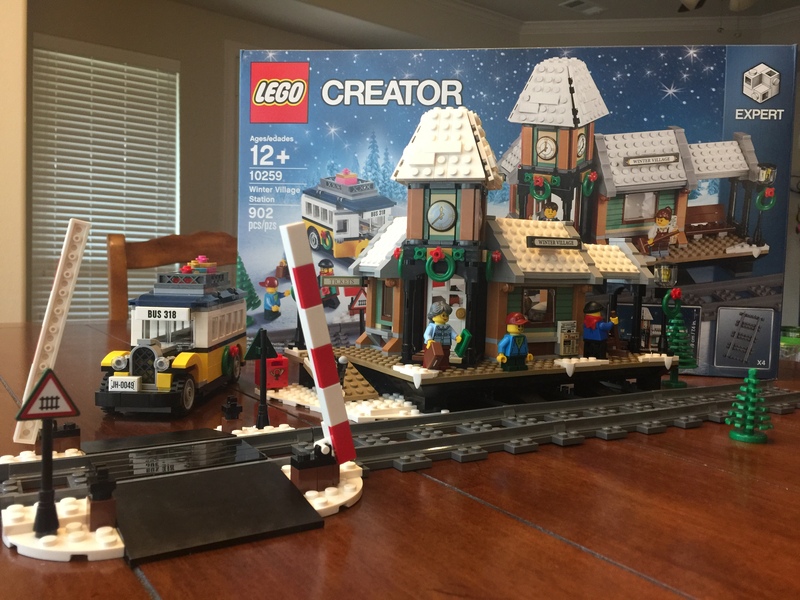 Each year since, I’ve purchased that year’s Winter Village set. The Toy Shop, the Winter Holiday Train, and this year’s set, Winter Village Station. 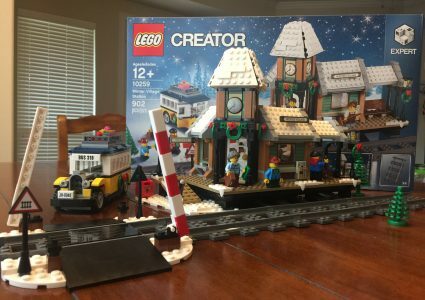 I was excited to see a train station to follow up last year’s Winter Holiday Train. 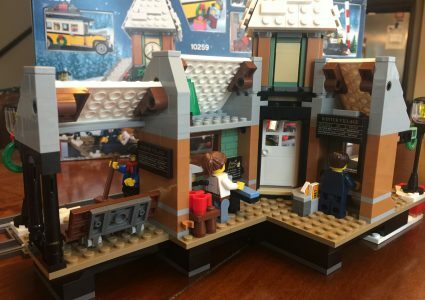 I was already thinking about how I could move from a small platform to a full blown station, and I was pleased when I saw LEGO® had solved that for me! 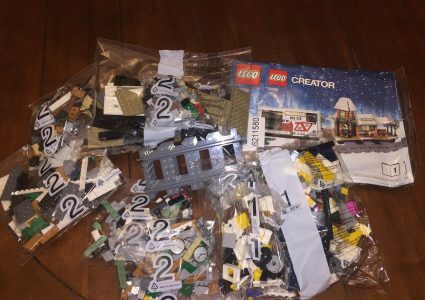 Let’s take a look at everything in this set, starting with the minifigures. You get 5 in this set, a ticket agent, barista, bus driver, grandmother, and a child. The ticket agent is wearing his official uniform, complete with the transportation logo. Having been to London recently, I can’t help but think he works for the “Tube”! His torso is printed with tie, and what looks like a pocket with a pen and notepad. He has pretty standard head and hair piece. His legs match his torso. The barista has a bit more detail. Her torso has her wearing a white shirt, with an apron covering it. She has a name tag, and cute coffee mug logo on the apron, a la a famous coffee chain we all frequent. The torso is also printed on the back side. The legs are also printed showing the apron continuing down and covering her legs. Another pretty standard head and hair piece finishes off this minifigure. She is equipped with a broom to keep things tidy. The bus driver’s torso shows him wearing a blue jacket, with printing on the back. Since he works in the elements, he also gets a red bandana as a scarf. This is the same piece that we’ve seen on robbers and such that hides their faces. I guess if our bus driver decides that bus driving wasn’t paying well, he could turn it around and rob the station, or the train! He has a standard black cap, which are also suspiciously used on criminals in LEGO® Police sets. His legs aren’t special, and our driver is sporting a beard and glasses. The grandma is wearing a light blue sweater, and the printing continues on the back of the torso. There is a bit of a festive pattern on the sweater, again on the front and back. She doesn’t appear to be too old, some wrinkles around her eyes. She is wearing glasses, and has long grey hair that is pulled back into a braid. Nothing special about her legs, which is pretty normal. Grandma does come with a suitcase and some money! Finally, we have the child. He has a blue hoodie on, that is shown on the front, and back of his torso. The print on the back is actually pretty cool, with the hood part on the back. His head is standard, and the he is wearing a red ballcap. LEGO® does use the short legs, so we know this is a child. It is a nice figure, but I think he is missing an accessory, like a toy of some kind. To get the train to to the station LEGO® has included 4 pieces of straight track. Part of the track includes a railroad crossing area, complete with manual crossing guards. The crossing is beautifully done, and includes signage for both sides of the track, as well as the protective arms. 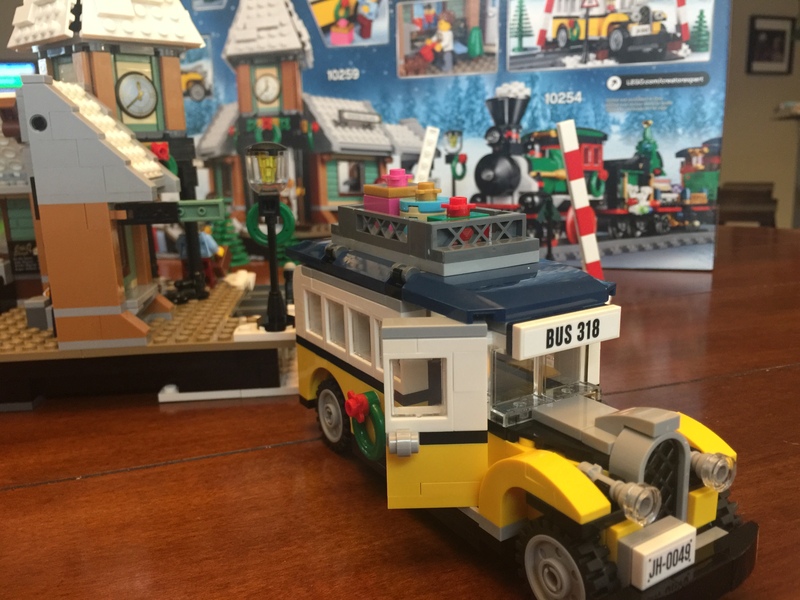 You may be asking yourself, “Why did LEGO® include the crossing?” Well it’s because they included a small bus! That’s right, included with the train station is a small bus, number 318, to ferry passengers from the station to various destinations within the village. 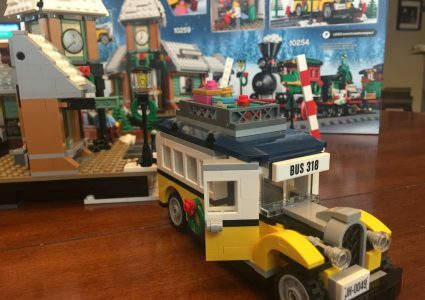 The bus includes a roof top rack to store luggage, or in this case, presents! 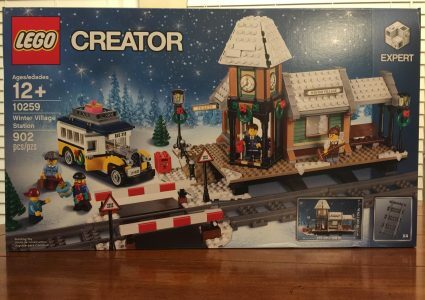 Next, is the station itself, which is why I purchased this set! It may be small, it holds quite a few fun features. On the outside there are two lamps that are beautifully decorated for Christmas. Snow has fallen, which means there is snow on the platform! LEGO® includes some of the 1/4 1×1 circle tiles to help achieve the snowy effect. 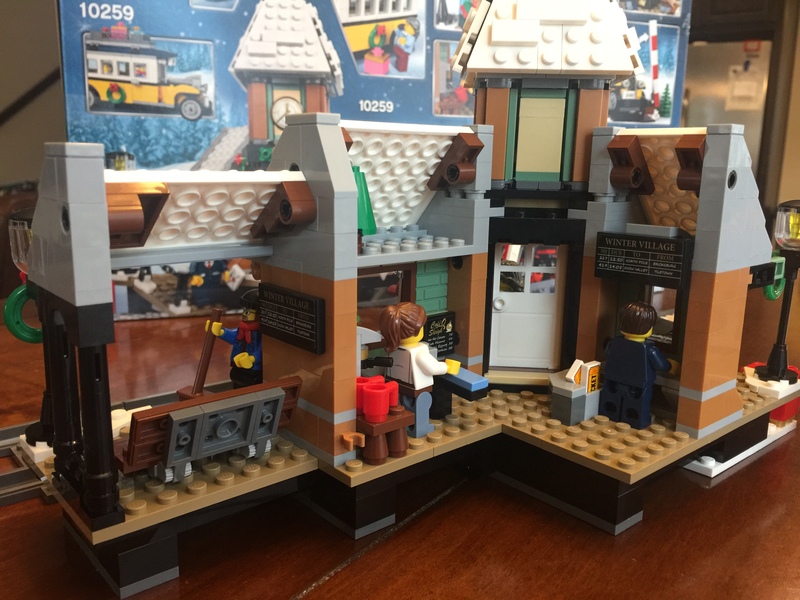 Before you enter the station, there is a mailbox so you can drop in letters to Santa. To help you climb up the ramp, there is a chain between two posts. 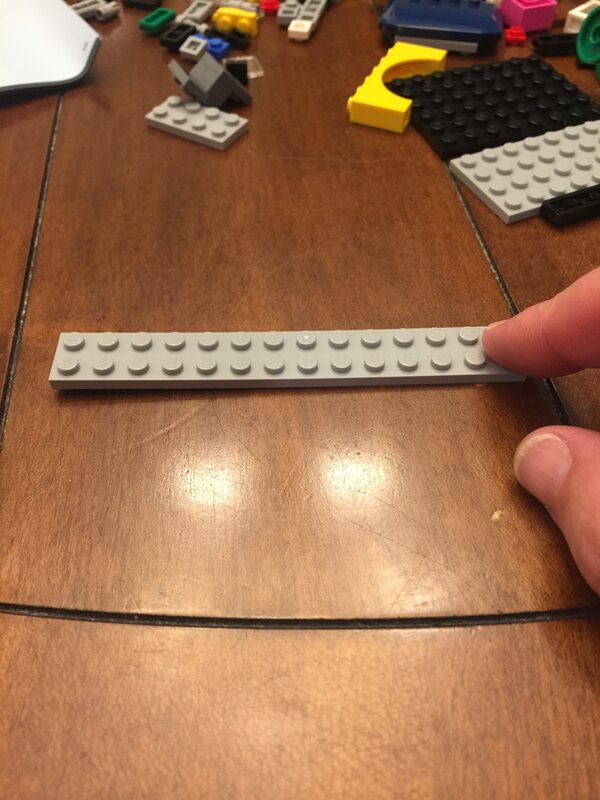 LEGO® devised a clever way to attach the chain and hold it in place. Two microphones push through the round ends of the chain into a shaft that clips into an upright holder. It looks great on the ramp up onto the platform. Once you get to the top of the ramp, you’ll notice the ticket window. There is a slot under the window where the transaction takes place, that allows you to slide the money and tickets through it. The main door into the station sits at an angle, complete with a tiled entrance. Above the door is the clock tower, with three synchronized clocks. The station is decorated with three wreathes to bring in the Christmas cheer! As you continue around the platform, you pass by a small news stand, complete with newspapers! Just past that is a covered waiting area. The waiting area features the time table for arriving and departing trains, as well as their destinations. The roof clearly marks the location of the station and where you’re arriving, Winter Village! As you venture inside you’ll find the ticket counter, as well as a coffee shop, complete with espresso machine! Decorating the interior is a small tree, up in the loft area. Another time table is setup in here so you can find out when a train arrives or departs as you warm up with a hot cup of coffee or cocoa. Note. If you look through the few pictures I posted, you’ll notice a 14×2 grey plate that is bent. This is the 2nd time I’ve had a long piece like this in a set that was bent. The first time was in the Saturn V rocket, and needed to be replaced as it was on the side and the studs could not overcome the bend, so it kept popping off. In this case the piece is used in the chassis of the vehicle, so it was able to sit straight. I wanted to point this out, as I’ve encountered it twice, and I hope it is not a growing trend. Overall, I really like this set. I do wish that LEGO® would get away from using stickers. I’m not really good on getting stickers onto parts so they are straight and centered, (nor is it kid friendly). I ask the Brick Mom, who happily does this for me. However, stickers do not last. They can get scratched, faded, dirty, etc. This does not make for a good long term display piece. 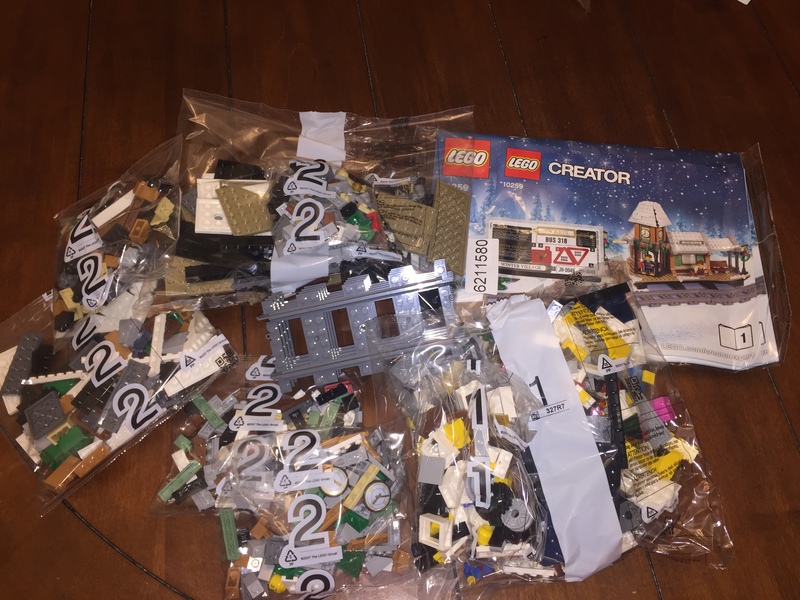 I have plenty of LEGO® sets that I got as a kid, and the majority of those stickers have either come off, torn, or gotten dirty. 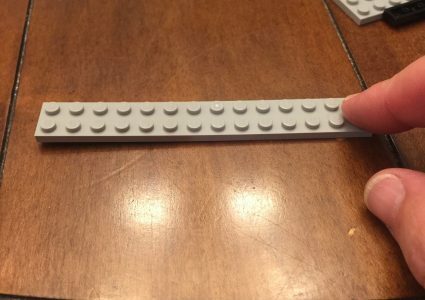 I know printing is another step, and another expense, but, it seems like we continue to pay a premium for LEGO®, and I don’t think it’ll cut too much into profits to replace stickers with printed bricks!